Departing Norfolk - In years gone by images of their village greens, thatched cottages and medieval churches have adorned the lids of many a chocolate box. We meet our Guide in Long Melford. 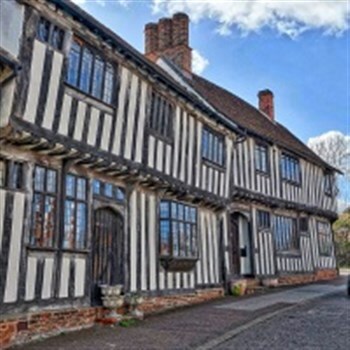 It is often said that if you only have one day in Suffolk you should visit Long Melford. We start our day with included tea/coffee and biscuits in a charming 15th Century hotel. Rejoining our coach we head off into the Scenic Suffolk countryside for a tour of a fine selection of chocolate box villages with large medieval churches and quaint thatched cottages, before returning back to Long Melford where you will have some free time to purchase lunch or just have a chance to look around. This afternoon we pass through more quintessential villages before crossing into the border into Essex and arriving at the wonderfully named village of Steeple Bumpstead. Here we meet the Chocolate Lady who has been creating delicious delights for many years. You will have a demonstration of chocolate making before enjoying an afternoon cream tea. There will also be an opportunity to purchase a memento of your visit.